Yes - drink more water and only water if you can! Most people know that the body needs water for hydration and optimum functioning of organs, but it also promotes weight loss. 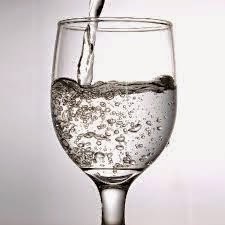 One way to consume fewer calories is to drink a full glass of water before every meal and snack. Drinking water before a meal will cause a person's stomach to feel full quicker, therefore causing them to eat less. Water also flushes out those pesky toxins that are in the environment and food we eat everyday. This is one of the hardest habits for most people to kick. Most of us love bread, pasta, potatoes, ect. Which is fine in moderation but not at every meal. Try to replace those carbs with smaller portions of protein like lean meats and fish and pair them with fruits and veggies at every meal if you can. If your going to eat carbs, eat them in the morning so you have the rest of the day to burn them off. Yes carbohydrates convert to sugar and then fat. No it doesn't matter if that bread is organic and glueten free :) It's a fact that carbs convert to sugar and sugar converts to fat - whether it's organic or not. So if you can limit them as much as possible, it's the best way to loose that extra weight fast! This is a no brainer right?! Well some people have problems eating healthy foods. But it's the best secret to loosing weight. Fruits and veggies are nutrient dense. This means that for their weight, most produce is low in calories; so you can eat a lot more when your diet is rich in veggies and fruits - and still not consume a whole lot of calories. Remember, all produce, from a juicy apple to a crisp romaine is packed with water and fiber. Which means their low in calories and make you feel fuller longer. Coconut Oil is very effective in reducing and maintaining weight. It contains short and medium-chain fatty acids that help in taking off excessive weight. It is also easy to digest and it helps in healthy functioning of the thyroid and enzymes systems. It increases your metabolism by removing stress on the pancreases, which burns more energy and helps overweight people loose weight. This is why people living in tropical coastal areas who eat coconut oil daily as their primary cooking oil and are much slimmer and healthier compared to other countries. Make sure you buy Organic Virigin Coconut Oil, otherwise you'll loose all the important beneficial nutrients. You want to also ensure it is USDA organic certified, because that means it has the highest quality organic certification, so it's 100% organic, natural and safe. In a 2009 study published in Bioscience, Biotechnology, and Biochemistry, it was found that subjects that consumed acetic acid for 12 weeks experienced significant declines in body weight, abdominal fat, waist circumference and triglycerides. Triglycerides contribute to the bad cholesterol which is what we want to avoid. Research shows significant weight loss benefits from sustained daily intake of acetic acid (which is a main ingredient in apple cider vinegar). To add ACV to your daily routine and assist with weight loss, add 2 tsp. - 1 tbsp. of Bragg's Organic Apple Cider Vinegar to 16 ounces of water. This concoction can be sipped throughout the day. If you don't like the taste, add some frozen fruit with Sweetleaf Stevia or a natural water enhancer like Skinny Girl Blueberry Acai droplets into water. I promise you won't taste it. Walking is easy, free and very effective! You can go outside and walk anywhere you want to and what a bonus to get that Vitamin D3 if the sun is out. Walking on a trail or up and down hill challenges your balance, which ups your overall calories by up to 82 percent! Brisk walking at 3 to 4 mph gets you into a moderate intensity workout zone, which is the minimum for a decent workout not only to lose weight but to increase cardiovascular fitness. Walking at 4.7 mph burns as many calories as jogging.